Most of the King Crab legs that you will find, have already been cooked and brine frozen. If processed right you should have great tasting King Crabs legs. If not properly handled, you will have legs that will taste extremely salty. Since frozen crab legs are already cooked, you will just need to heat them up. King Crab Legs are not cheap so extra care should be given not only in cooking your legs, but also in preparing to cook them. 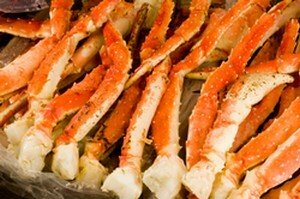 If you havent bought King crabs before you can get tips here on Alaskan King Crab. Thaw your king crab in the refrigerator; never do a quick thaw under water or in the microwave. It usually takes about 24 hours for legs to thaw in the refrigerator. Once thawed it's best to heat them right away for the best flavor. Notice I didn't mention boiling king crab, and heres why. Most people won't have a pot large enough to boil the legs without breaking them up. When you break the legs up this allows all that water to get into your meat making them soggy, plus you loose a lot of crab flavor into the water. You will need to adjust your cooking time if you are cooking large amounts of king crab or you have larger legs. The bigger around the legs the more cooking time you will need to add. Using a large pot , fill the pot until the water is at the bottom of your steamer basket or grate. Cover the pot and bring to boil. Place your crab legs in basket (You can bend or break the legs to fit into the steamer) and steam for 5 to 7 minutes. The oven is my preferred method for cooking king crab legs. Just place the thawed king crabs single layer in a large baking pan, add about 1/8 inch water to the pan. Cover with aluminum foil and in a preheated 400 degree oven and bake for about 10 to 15 minutes. Place the legs on the grill, but make sure your temperature is not to hot or you will dry them out. Gas grills are great because you have more control over the temperature than a charcoal grill. I usually set my gas grill on medium for just the right temperature. I like to place the legs in foil and grill for 10 to 15 minutes.